Update: iOS Calendar apps List View has been changed significantly from iOS 7.1 onward, learn how to access the new and improved version here for the iPhone and iPod touch. Users continuing to run prior versions of iOS can continue to find the broad events list using instructions detailed below. 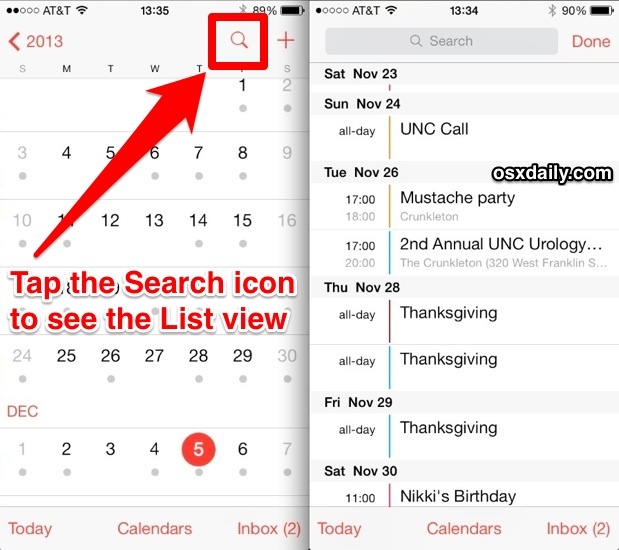 My preferred view in the Calendar app has always been the “List” view, which unfortunately disappeared with iOS 7. Or so I thought! Just found it the other day when I clicked on the Magnify Glass to bring up a search field – the search field does pop open, but has the added benefit of putting the calendar into the previously missing list view. You can now scroll through the list view as normal to see what’s coming up on the event schedule, or to see what already passed in your timeline. Note that a “Search” box does appear atop the List view so if you do want to search through dates and events, this is still how you do it, perhaps explaining the icons usage. Admittedly this is a bit strange if all you want to do is access a list of events, and users may expect to see this change to be a bit more obvious in a future update of iOS so that it makes more sense. For now though, clicking on what looks like a “Search” icon (nearly identical to that of the OS X Spotlight search icon) is how you show the List view in Calendar app… alrighty then, we’re just glad it works and there’s a quick way to see all scheduled events in a single view again! Despite a few peculiar experiences like this one since the major iOS revamp, all of these great tips for Calendar app continue to work. Master them once and you’ll be forever on top of whatever plans you have defined in your mobile world. Just tried it in OS 7.1 and it doesn’t work. Is there another way to list view on the iPhone?